Do you know Jacked Kitchen? If you don't, get acquainted! 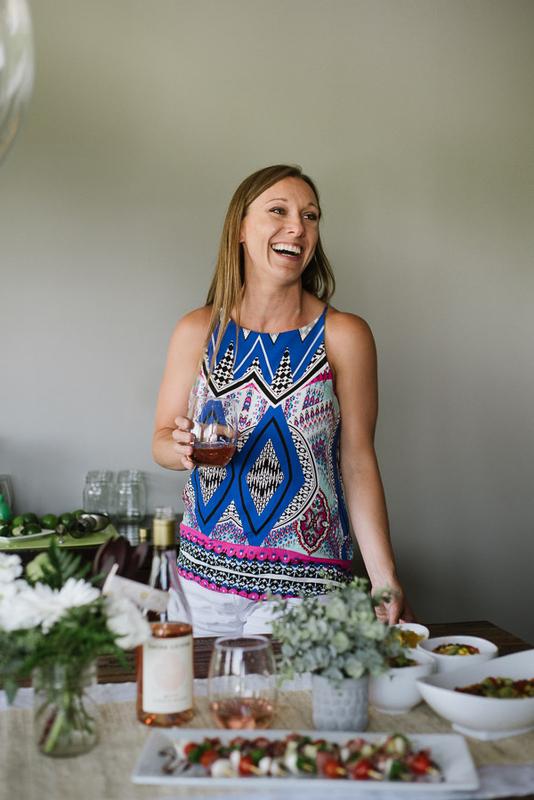 Amy Biedenharn, the home chef behind the food blog, is also one of my favorite people! I know Amy from competing way back when on the gymnastics team at Illinois State. In college Amy was obviously a way better cook than I could ever dream, even for college standards. 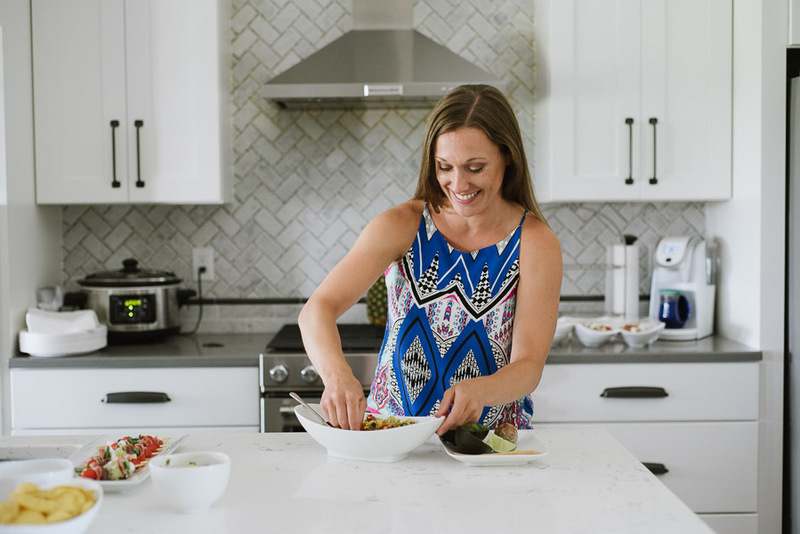 Over the years, Amy has honed her culinary approach and strives to make home cooking attainable even for the most kitchen-challenged [me]! Being in Hawaii means I can't always be her test subject anymore, but perhaps we'll do an island segment one day! What inspires me about Jacked Kitchen is the approach that food is fuel and that everything in moderation is a realistic approach. It encourages whole foods, scratch cooking and eating well rounded from a variety of sources. As a little girl I enjoyed spending time in the kitchen with my mom or dad making food. Being a kid from the country, my dad labored over gardens so we always had fresh fruit and vegetables around the house. I quickly learned that making things with fresh ingredients and from scratch always taste better than cutting corners. 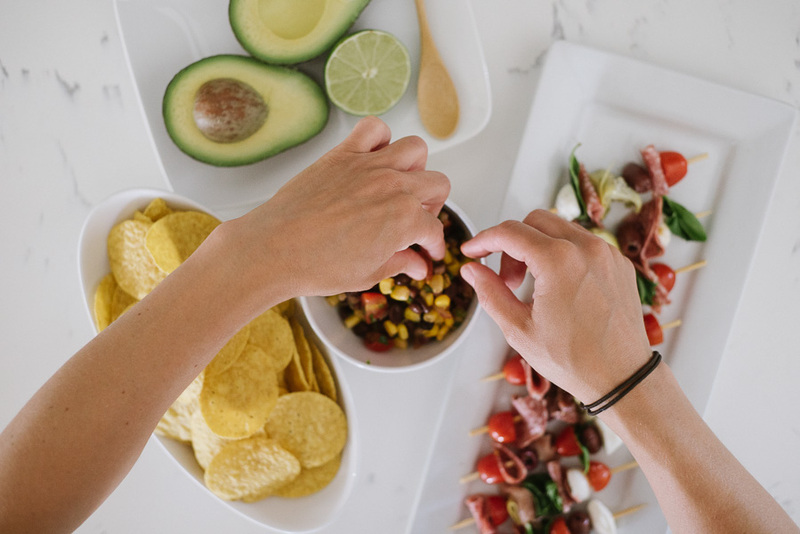 We finally got some time to do a quick kitchen demo [anti-pasto skewers and black bean avo salsa] and got to ask Amy a few burning questions that I think shed so much light on her brand and approach. 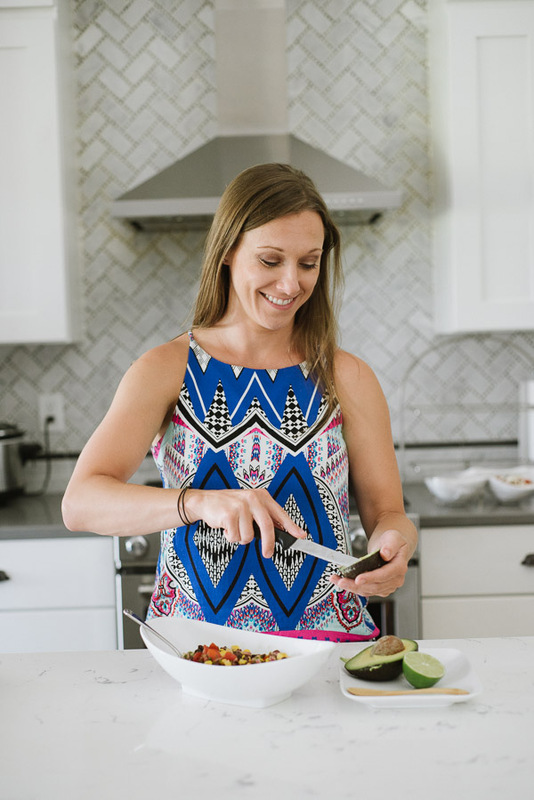 Find out what her inspirations are, what she'd do if she met Bobby Flay, and some of her best grocery store tips. If you read only one thing in this post, scroll down to her top grocery store tips - life saving tips! I hope she inspires you to create more in the kitchen! Eating got me into cooking. Ordering food at restaurants, eating meals prepared by somebody else, tasting and trying and then wanting to figure out how I could duplicate it myself got me in the kitchen to realize that I really like to cook. Now, I didn’t say bake. I don’t dislike baking, but there are just too many rules. And baking usually involves making something sweet and decadent that I shouldn’t be eating anyway. Followed by me eating all of it….by myself….and then feeling guilty about myself. It’s a vicious cycle I like to avoid. As a cook, I get to make things up as I go. In my work life I feel like I’m running on a constant hamster wheel and never getting anything done. At the end of the day being able to prepare a meal from start to finish helps ease me off the hamster wheel. Remember the old saying, “you are what you eat”. You know that is true right?? I hope that if I put good things in my body, I’ll feel my best and take good care of the one body that I have. I started my blog knowing that I’m not a trained chef and have no plans to be. I love to cook and have found that with a little heart and knowledge you can learn to make very satisfying healthy meals. I’m inspired by inspiring others to find comfort in the kitchen and learn how to make food that tastes good. I enjoy sharing what I make in hopes that others will feel inspired to do the same. What are your top 3 favorite recipes you've made? For somebody who likes to cook picking your top three favorite recipes is like a parent trying to pick their favorite child. They are all so different and special in their own way. And even if you do pick, you immediately think of all the reasons another choice could have been your favorite. But, because you are making me pick, I’ll narrow it down for you. My favorite recipes are ones that serve as a base to many other recipes. My first pick, roasted vegetables. Depending on what is fresh during the current season it may be onions, zucchini, asparagus or squash, cauliflower and Brussel sprouts. Roasting vegetables are great plain, but work as a platform in many other ways. I love to put them with pasta, throw in seasoning and stir in some cheese. Or, add a Mexican spin with a burrito or quesadilla. Even for breakfast roasted vegetables are great in an omelet or frittata. Choice number two goes to a child hood favorite – Cincinnati chili. This was the first meal I remember craving as a child. My mom used to make (and still does make) one of the best version of Cincinnati chili. I use the same recipe today (with some minor “jacked” tweaks of course). It sounds so simple, but choice number three goes to homemade salsa. As I mentioned earlier, helping my dad cook in the kitchen and watching him use many fresh ingredients from the garden was a huge part of what got me into cooking. I vividly remember days of chopping fresh tomatoes, onions, jalapenos, and cilantro. I learned to cook by taste not by recipe. When it is summer and tomatoes are ripe, nothing tastes better than garden fresh, homemade salsa. Add in tacos, guacamole, fajitas, nachos, enchiladas…..does it get much better?! 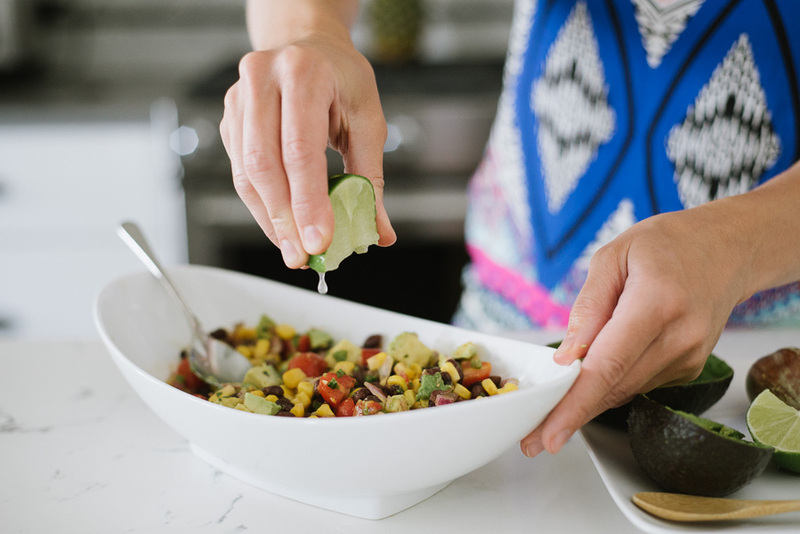 Black beans, corn, diced tomato and avo with fresh squeezed lime makes a quick party side to share. Where do you like to dine when you are not cooking at home? Eating out is my opportunity to try foods that I don’t make at home. I usually pick from a menu based on ingredients I don’t have, don’t feel comfortable cooking, or uses a cooking technique I don’t have the ability to do. That sounds more complicated than it really it. Take pizza. I don’t turn down many styles of pizza. I’ll take a frozen pizza or a fancy hand-tossed brick oven style pizza. But getting the dough just right is no easy skill. You want it stretchy and doughy, but crunchy and crispy. You want cheese that is gooey, but also toasted just to a crisp on top. The art of pizza is all about the oven and lots of heat. Duplicating that at home is a tough one. Perfectly crispy fries, doughnuts done just right, meals with layers and layers of ingredients, slow cooked meats and sauces seasoned and reduced for hours are the restaurant perks that catch my eye. 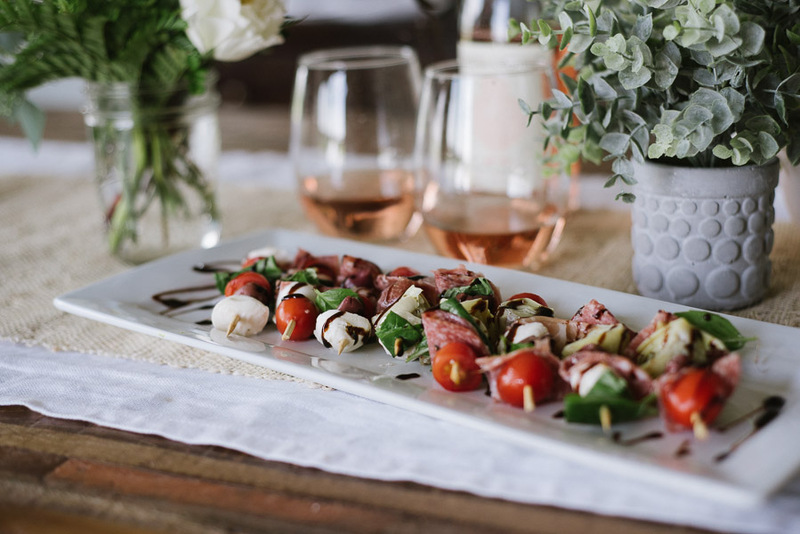 Anti-pasto skewers are so easy. Find what you like and add them on! In this skewer, Jacked Kitchen alternated cherry tomatoes, artichokes, salami, mozzarella, and basil. Drizzle with balsamic glaze to finish. Jack. Oh, my buddy Jack. Jacked Kitchen wouldn’t exist without him. The name “jacked” has dual meaning. It’s a spinoff of my dog’s name, Jack, and defines that my food is a step above just basic cooking – it’s jacked. Jack has been with me since 2009. In the kitchen he is my side kick watching for every dropped crumb or new smell to come wafting his way. He knows the sound of the cheese drawer when it opens and the sound of the knife on the cutting board. He has a sweet tooth for fruit, a weakness for cheese and puts a deathly shake on any crunchy vegetable. Jack has a blue and brown eye which is the inspiration for the blue color used in the Jacked Kitchen logo. Jack makes an appearance from time to time on the blog. Sometimes when he squeezes his little nose into the frame of my camera. I swear he knows when I put the camera up to my face he has a few second window to swoop in for a lick before I can see him in the shot. He's my favorite food critique because he looks at everything I make like it’s the best thing he’s ever seen. 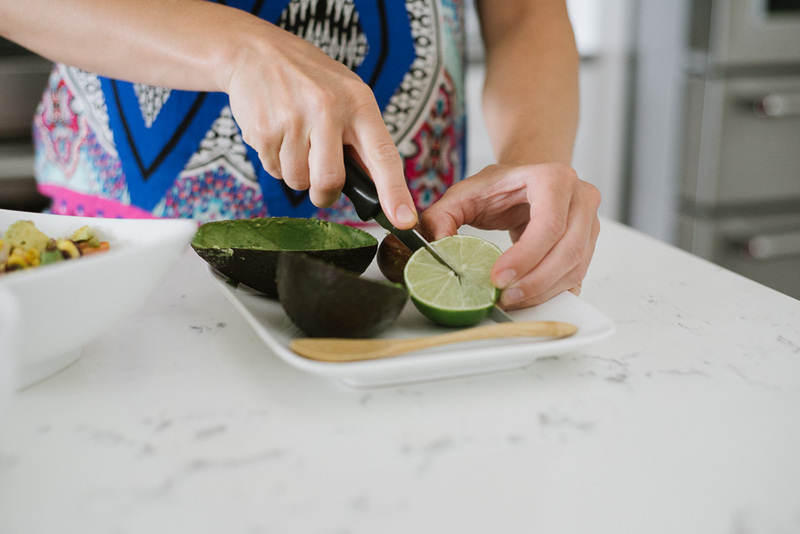 What's the best tip for someone who is intimated in the kitchen to get started? A really good meal doesn’t require a million ingredients. You don’t need to hunt for a recipe list that is a mile long or requires a bunch of steps. You can make really tasty food, with just a handful of ingredients. Keep it simple. Learn a few techniques you are comfortable doing and get good at them. For example, how to cook pasta to just the right texture, grilling or baking meat that is still juicy, sautéing vegetables or getting comfortable how to season with salt. What do you look for when you grocery shop? Tell us your store tips! Oh the love hate relationship with the grocery store! My first tip, figure out the busiest times at your grocery store and AVOID those times. Also avoid shopping on Monday. The store has been cleared out all weekend and you’ll be digging through the bottom of the barrel. Know what your grocery store does well. I don’t buy everything at one grocery store. I know, I know, that sounds impractical and time consuming, but it’s not that bad if you know what you are going for. Do your bargain, packaged food shopping at the right place. Hit up the meat market for the best meats. Know what place has the best produce. If you can do one stop shopping great, but you may need to shop around. Pick out meals or recipes you want to make. Make a list. Then remake your list in the order of the grocery store. It’s so much easier to follow. When you make that recipe list, pick your meals using similar ingredients so you don’t waste food. If have to buy a handful of fresh cilantro or a block of feta cheese, menu plan other recipes that also use cilantro or feta so you don’t waste it. Do a little research to find out how long food lasts. One, so you don’t prematurely throw something away and two, so you don’t eat something that has gone bad. In the spirit of “jacked” kitchen, try to make things from scratch because it always tastes better and often saves you some money. Homemade salad (versus the bagged mixes), chop your own veggies, make your own salad dressing and sauces, grate your own cheese. You should get yourself a treat. Leave the store with at least one thing that you really want to reach in the shopping bag and open on the way home. For me, that is usually something sweet, but maybe you are a sucker for salt and crunch. Trips to the grocery store don’t feel so bad if you have a reward when it’s all over. Lastly, if you have time to stroll the aisles, take a look around and buy something you may not always buy. It can be easy to get in a food rut that you eat or cook the same thing. The grocery store is full of inspiration if you slow down and take a look around. If you would challenge Bobby Flay in a throw down, what would you cook? Just thinking about this question is intimidating! I spend a lot of time figuring out ways to make vegetarian meals that taste good yet aren’t trying to imitate something non-vegetarian. I am not a vegetarian, but I do try to cook that way for the health benefits. In that name, I would love to challenge Bobby to a vegetarian meal. Maybe a veggie burger. One that doesn’t fall apart or taste like a pile of mush. Or some version of a veggie sandwich that isn’t just raw vegetables piled between two pieces of boring sandwich bread. A great sandwich needs really good, bakery style bread, a sauce full of flavor, well-seasoned vegetables and of course a cheese that brings it all together. I don’t know yet what this sandwich would be so I’d say I’m not yet ready for a throw-down, but my wheels are definitely spinning in case I get the call. Join Jacked Kitchen on Instagram at @Jackedkitchen! See you there!